PJD continues to work on the Carolina Carports bike, as the Hair Club for Men hires Senior and OCC. When Mikey confesses to Junior that he is losing hope in Senior, Junior advises his brother to protect himself. Senior finally agrees to Mikey's terms and visits a therapist, but Mikey's not impressed. Finally, Junior travels to North Carolina to unveil his bike to a crowd of 400,000. Watch video from Hair Club Men I and Caroline Carports Bike II. Junior starts on a bike for Carolina Carports as the OCC crew continues building the Blackhawks bike, taking a break to shoot holes through Senior's office door with an air cannon. When a Senior look-alike shows up at his shop, Senior decides to play a trick on his son by sending him to PJD. Finally, as he helps Gus adjust to losing his leg, Senior decides he's willing to meet Mikey's terms and see a therapist. Watch video from Chicago Blackhawks Bike IIand Caroline Carports Bike I. Watch video from Chicago Blackhawks Bike I and Bling Star Bike II. After Junior debuts his first bike at Sturgis, PJD is swamped with fan mail and emails from people wanting bikes. While he prepares for his wedding, Junior puts Odi in charge of PJD's Bling Star quad build. Meanwhile, the OCC team puts together a military bike for the National Fallen Heroes Memorial. Senior receives an invitation to Junior's wedding and is unsure whether he will attend. Deciding to reach out to Mikey, Senior e-mails his son asking him to meet up ... but Mikey expresses unresolved emotions over the situation, and ultimately, he and Junior have a sit-down to discuss whether or not their father still fits in their lives. Watch video from Fallen Heroes Bike and Bling Star Bike I. With the Sturgis Bike Rally just around the corner, Paul Jr. and team scramble to complete their Anti-Venom and Geico bikes for PJD's world-premiere unveil. At OCC, Paul Sr. and crew continue to fine-tune the innovative Lawless Electric Drag bike for their final attempt to break the world speed record. Junior wonders whether Senior will show his support by attending one of his reveals, but Senior has no interest in seeing either of his son's first bikes. The two teams arrive at Sturgis to face off for the first time. Watch video from Lawless Drag Bike II, PJD Bike IV, Geico Bike III. Paul Sr. and OCC team up with the guys at Lawless Racing in an attempt to set a new world-speed record with an all-electric drag bike. At Paul Jr. Designs, Paulie and the crew pull double duty to finish the first bikes to come out of his shop: the Anti-Venom and Geico bikes. The pressure is on as both shops race to complete their choppers in time for Sturgis. Meanwhile, Mikey is upset with how Junior has been treating him lately and has thoughts of striking out on his own. Watch video from Lawless Drag Bike I, PJD Bike III, and Geico Bike II. Senior and the team at OCC are tapped to build a bike for the FBI and the local Newburgh police department, in an effort to shed some light on the town's growing problem with gang-related crime. Meanwhile, Junior and the guys at Paul Jr. Designs are furiously attempting to fabricate both the Geico bike and the PJD Anti-Venom bike in time for the Sturgis Bike Rally. To help him accomplish these tasks, Paulie brings in his old friend Lee, a former fabricator at OCC. The war between shops heats up as Senior tries to rehire Lee before he gets to Junior's shop. Mikey and Vinnie are guests on a local talk radio show to help sell bikes for Paul Jr. Designs. Senior, tuning in, doesn't like what he hears, so he and his team set their sights on a new type of challenge. They build a ramp to launch a dummy dressed as Junior over a creek in front of the shop. Meanwhile, Junior and his team begin fabricating their very first chopper, the PJD Anti-Venom bike. As the tasks pile up, Junior realizes that he needs help in the paint department, so he recruits his old friend Nubs to the team. Stress levels reach an all-time high when Junior gets a call from insurance giant Geico, who wants a bike built to unveil at Sturgis. Watch video from PJD Bike Part I. The guys at OCC are tapped to build the ultimate meteorite-hunting vehicle for the Science Channel's Meteorite Men. Meanwhile Paul Jr. moves forward with his plans for his first solo bike build, a web-themed bike that he claims will rival anything he's built in the past. Just as the parts for the new bike start rolling in, a tragic accident rocks Paul Jr. Designs to its core. As word quickly gets back to OCC, Senior puts their differences aside and reaches out to Junior and Mikey. Watch video from Meteorite Men Bike. The Teutuls find themselves in front of a judge as Senior sues Junior for his 20 percent ownership of OCC. Meanwhile, the team at OCC is hard at work on a chopper for ESAB, one of the oldest welding-equipment companies in the country. Over at Paul Jr. Designs, which is struggling to land its first client, Junior decides to build his own bike, while Mikey, trying to get his life back on track, hires a personal assistant to help keep him in line. Watch video for ESAB Bike. Paul Jr. and his team are hard at work outfitting his new bike shop from scratch. Not believing Junior can compete with OCC, Senior is annoyed that Paulie is going after all his vendors. Meanwhile, back at OCC the guys are building a tribute bike for the late founder of window giant Window World. To put the company's product to the test, Senior unleashes an ATV powered by a 2,000-horsepower jet engine on one of its windows. Watch video from Window World Bike. The Teutuls are at it again. Paul Sr., Mikey and Junior air the family's dirty laundry on a radio morning show, acknowledging that Senior is suing Junior over the 20 percent stake Junior still owns in OCC. 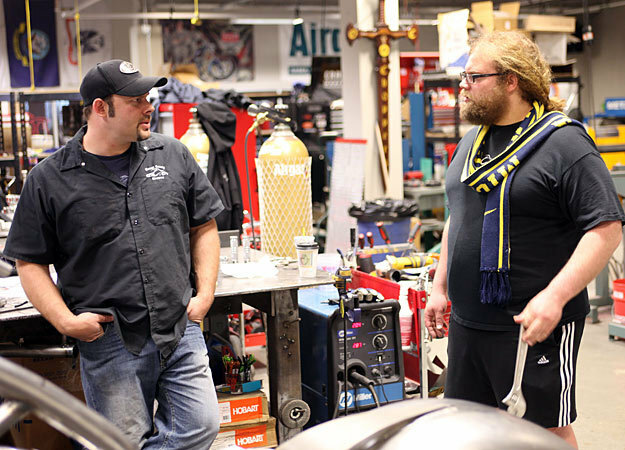 Junior announces that he is going to become a direct competitor of his father by opening up his own bike shop under his design company, Paul Jr. designs, enlisting the help of former OCC mechanic Vinnie DiMartino. Meanwhile, the work continues at OCC as Senior and the guys create a one-of-a-kind bike for Web design firm Domani Studios. Watch video from Domani Studios Bike.